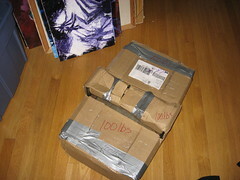 My new press arrived very well packaged. I was kind of worried about this since the sellers seemed pretty reluctant to have to deal with shipping. 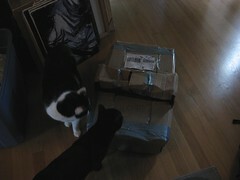 I’m not surprised now after actually receiving the package since it’s quite heavy. The press is only about 16.5×26″ in size but weighs 100 pounds! Also, this press was obviously fixed up recently since it was oiled and greased so it rolls so smoothly. There are still a couple of problem areas that need to be cleaned such as a little bit of surface rust. Very minor. I was so excited to come across this press on eBay with only 15 minutes left in the bidding. I got such a sweet deal even including shipping fees for this 100 pound item. The shipping ended up being more than my winning bid! This is also exciting for me since this is the same press I used throughout college. We had many presses in the print lab to choose from, however, this press and I grew very attached. 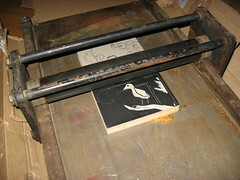 A few interesting details: This is a Nolan flatbed letterpress also referred to as a “proofing press”. It was used back in the day as a quick way to run small batch prints or to proof typesetting before installing it into the big letterpress. This press is very easy to operate and has no mechanical adjustments (probably the main reason why it was intended for proofing). 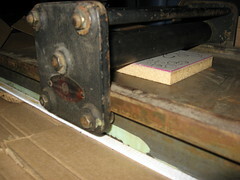 Printing is done manually moving the roller across the block. When I was in college, the way we adjusted pressure with this press is to use a layer of newsprint–adding more until you get the correct amount of pressure. It worked very well. I might consider investing in a good felt blanket for this press. Now I have to buy more printing inks! I hope to show some examples of printing done with this press soon. 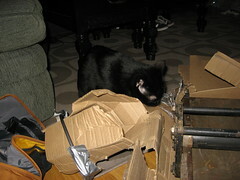 I was anxious to get started tonight but couldn’t since it’s still sitting in the middle of my living room floor. I need to have my boyfriend come over to carry it downstairs to my studio. This entry was posted on April 10, 2007 at 11:49 pm	and is filed under Uncategorized. You can follow any responses to this entry through the RSS 2.0 feed. You can leave a response, or trackback from your own site.